Earlier in my career, before I knew what I know now, I used to do a little trick to find out if I was going to be in good voice for the day. As soon as I woke up, before I even opened my eyes, I would make a few little sounds climbing up into my head voice... light little short "oo" stabs. If I could take this sound up pretty high, I knew I would be in good shape. If I couldn't take this sound high, I knew I was going to have a more limited voice for the day. Argh!! That indicator could be depressing if I had a national jingle, a major venue performance, or just a background session with other great singers with whom I had to hold my own. The vocal cords are, as I've written about before, controlled by two sets of muscles... one set works the chest voice, one set works the head voice. When strength of these sets of muscles is unbalanced, the "hand-off" between chest and head voice is shaky and unpredictable. The chest voice tends to become "throat voice" (very, very bad) in the upper chest register instead of blended voice (very, very good), which you can't feel in your throat unless you put your hand on it and feel the wonderful , strain-free vibration. Guess which muscle set is usually weakest with contemporary singers? Right... the chest register set. So... that tells us what to do about the problem: Strengthen the head register set!! NEVER, NEVER sing your head voice so high that you feel vocal strain. 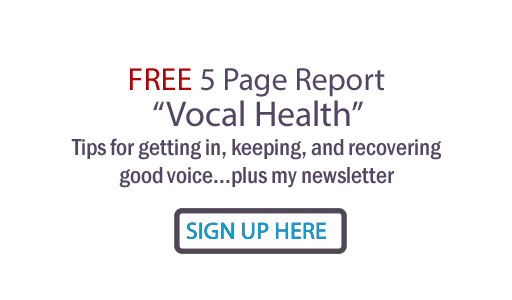 Find out how to take your voice up with no throat tightening (such as the pulling method I teach in "Power, Path & Performance" ). Take your voice up GRADUALLY and CAREFULLY... a scale at a time that you raise a half step at a time. Know that you can do ANY vocal exercise wrong... including mine. Like martial arts, golf, dance, etc... form is everything! Do not sing in a breathy head voice... this is like the sahara desert to your dehydrating vocal cords. Sing in clear, focused, bell-like tones. Do not go higher than your throat channel can stay open! On the other hand... If you have been classically trained and want to sing contemporary material, you may experience the opposite problem... you may have trouble getting into chest voice in your middle range. You take your head voice down too low and it makes contemporary voice sound weak and inauthentic. What to do? Strengthen the muscle set that works your chest voice! Again.. be careful how you do this. NEVER, NEVER sing your chest voice so high that you feel vocal strain. Again... learn how to pull your voice up, like I teach with Power, Path & Performance vocal training. Do not lean forward while trying to get your chest voice higher! This will close your chest and cause too much breath pressure to be applied to your poor vocal cords. Try for a buzzing feeling instead of a "hooty" sound. Try for a "talking" tone rather than a "sing-y" tone. If your speaking is thin or hooty, you must train your speaking voice, too. Learn to adjust your head, body and breath pressure so you can allow the "buzz" to travel up and down instead of trying to sing everything the same way... which WILL cause strain, and a terrible vocal break. Try to make the top of your chest voice sound almost just like the bottom of your head voice. In short, the "brass ring" technique you should seek is to make your chest voice and head voice blend strainlessly together, allowing your automatic nervous system to instruct the larynx to tilt slightly back and forth as you go through your range. This effectively creates the "middle voice" which is constantly adjusting and changing to allow the powerful yet strain-free contemporary singing that can blow your mind, and your audience's heart... without blowing your voice! Comments always welcome... remember, if you're reading this through your email, you'll have to actually click the headline and go online to find the comment link. Happy singing! I'm not a singer, but subscribed to your blog (more later). Reading your current post about head and heart resonated with me, not for the singing reference, but for the analogy to head and heart. After backing off many times from calling a relationship quits, I finally realized I had to follow my head. It was interesting reading your words about balance, working within range, and not taking things too far. Where you talked music, I thought about my relationship. Thanks much. Oh, back to what led me to your blog. I've been going through my (and my family) albums . . . perhaps 200 of them. Here again, respecting (?) them, I thought I would look at each one, read the jackets (and sometimes lyrics), and play bits on iTunes to see which ones I'd recapture as individual songs or CDs. Reading the comments on one of them (I don't recall which one), I came across someone who said your song made the album. So . . . I went looking for more info on you, read your bio, and found your blog. I admire what you've done, revitalizing, recreating, and reintroducing your life, your talent, and your teachings. Thank you! Pati... you have touched on an important truth... there are deep correlations between what works for the voice and what works in many other areas... including life in general. Backing off the pressure, not trying too hard, learning where to apply effort and not apply effort, etc. There are correlations between the voice and every physical sport you can think of. Thanks so much for your comments.. and I'm glad you still enjoy the music! Please keep in touch.